Commonly worn by tennis and golf players, the polo shirt can be portrayed synonymous with that of a sporty chic look. So when considering the purchase of embroidered polo shirts for an organization, think about who will be wearing the shirt, what environment it will be worn in, and the brand-identity you’re trying to establish. While the first polo shirts ever made were crafted out of cotton, today's versions offer more fabric options. These include cotton and polyester blends, as well as those made of 100 percent polyester. Cotton is a breathable, soft, quality fabric; whereas the blends are renowned for their wrinkle-free feature. Blends are also less likely to shrink, whereas cotton can often shrink easily and may not be as durable as other fabrics. Polyester versions are celebrated for their moisture-wicking ability and longevity, especially after being washed over and over again. Most polo shirts are one color, though color blocking is also popular. Think about how the logo will appear on a solid shirt versus one with two or more colors. Which will help the logo stand out better. Brand guidelines define specific colors of logos in terms of Pantones. When considering embroidery and thread color, try to stick with the closest match for your logo when working with your decorator. A slight difference might only be noticed if you put a Pantone book up against the sewn logo, but who carries around a Pantone book. Also remember that the logo colors may look different depending on the lighting in the environment. Make sure to consult with your decorator regarding what thread colors to use. You may also want to read over this Pantone Reference Guide that goes into more detail about screen printing inks and Pantone colors. Before outfitting your company, think about the kind environment your shirts will be in and the desired performance your organizational members might expect. Do your members need a garment that leaves them cool and dry when working in outside conditions? Features like moisture-wicking properties and anti-odor technology can help your shirts stay dry and prevent the growth of odor-causing microbes. 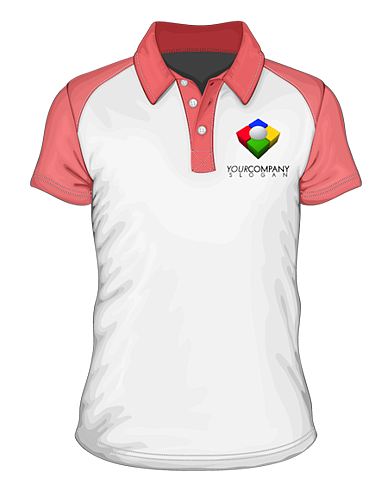 In the golf apparel industry, polo shirts are often made from polyester microfiber, a material designed to make the shirts lighter than other fabrics, such as 100% cotton. But don’t completely rule out cotton when thinking about your fabric. Fabric techniques that use blended materials to create polo shirts can offer multi-performance features beneficial for specific environments. A good example of this is the blended material consisting of cotton and poly microfiber blends, a combination that allows for a more moveable and flexible garment. When it comes to decorating your company's polo shirts, it's important to consider what type of decoration options are best suited for your garment. Whether that's screen print, direct-to-garment print, or embroidery, you'll want to work with your decorator to choose the best options. Think about what decorations the shirt will feature. Do you want to feature only the logo, or do you prefer a garment with additional design elements? Traditional embroidered polo shirts typically feature the logo decoration in the left chest area, but there are plenty of other ways to decorate a polo shirt. Whether its the traditional classic decoration or something more stylish, try to think outside the t-shirt box and consider the many options available to you. Take a look at our free guide “Recommended Decoration Techniques for Custom Apparel”. In this guide, you’ll find some common recommendations that highlight the best decoration techniques for the most commonly imprinted apparel.